My setup is finally done and I have ran a few brews through it. I am amazed at how easy things went in both brews. My brewing experience with my propane set was much different. Hitting my OG was hit and miss at best. All the numbers in these first 2 brews were right on the money. Wow! Awesome setup! I really like the hood. Wow. That looks great. Love the dark wood accents. I agree, Kal's setup makes it easy. It becomes more about the beer and less about the process. That is a sweet setup you have. Do you have a picture of the rest of that room? I love it! Would you mind if I posted it on our testimonials page with the text from your first post? Looks Great! Now we need more detail, Do tell. 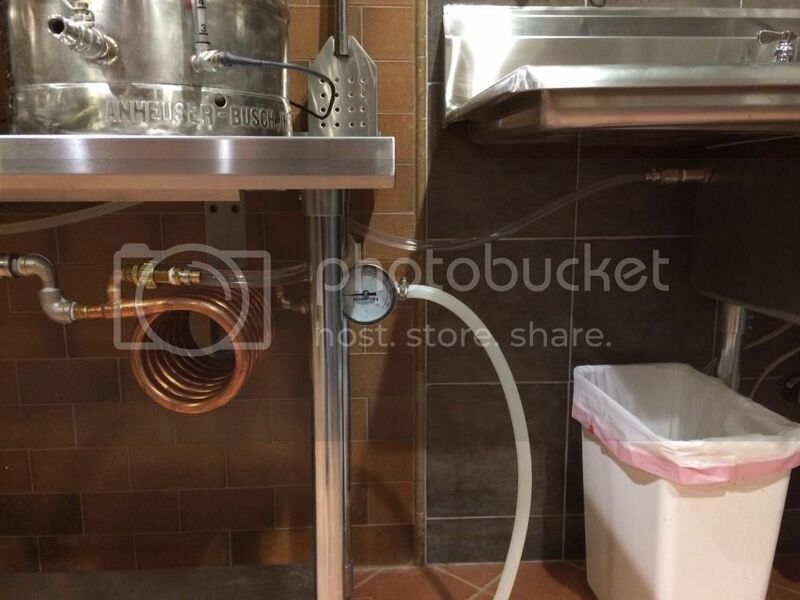 Great work - what is that hose attached to the back wall behind your brew stand? 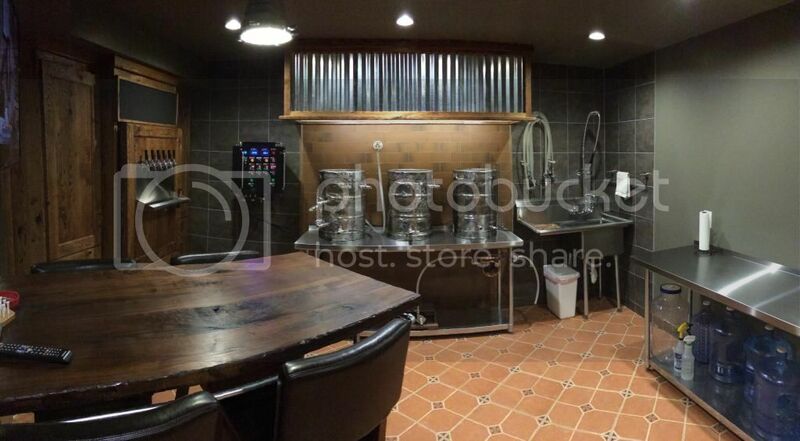 Is that a pot filler with a water hose of some kind? I would be honored to have this featured in the testimonials section. Yes, it is a pot filler. I only use it for chilling the wort though. My tap water is not suitable for brewing unfortunately so I use RO water right now. I have plumbed it so that I can hook it up to the HERMS coil and use the HLT as a pre chiller for the summer months when the ground water is a bit warmer. Right now I just run it right to the chiller and with 52 deg ground water I have been chilling 5 gal in less than 6 minutes. 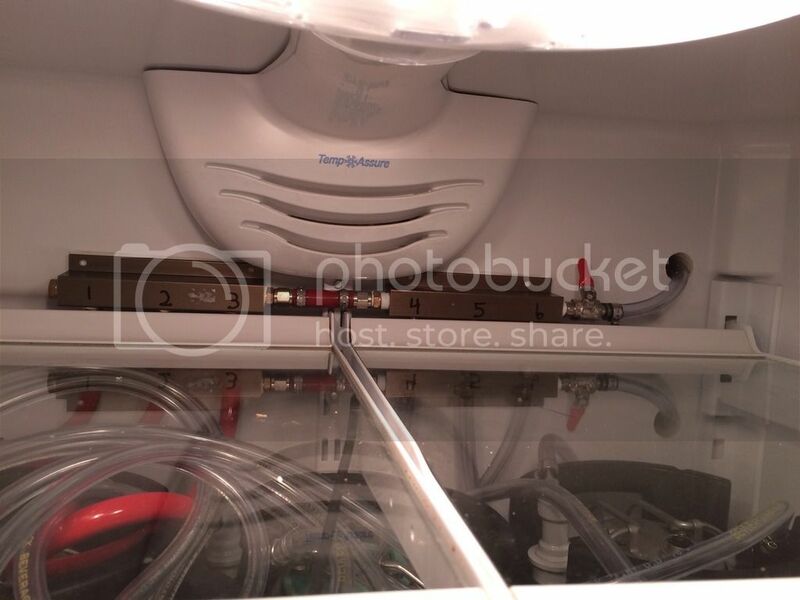 I also, hard plumbed the exhaust water from the chiller into the side of the sink. I added a second photo you had in your account with the taps so that others could see that too up close. Nice work! Question - Is your CFC mounted horizontally? Yes it is. Here is a close up of it. Can you tell me a bit more about how you're venting, how you made that nice hood, and what size blower you have? 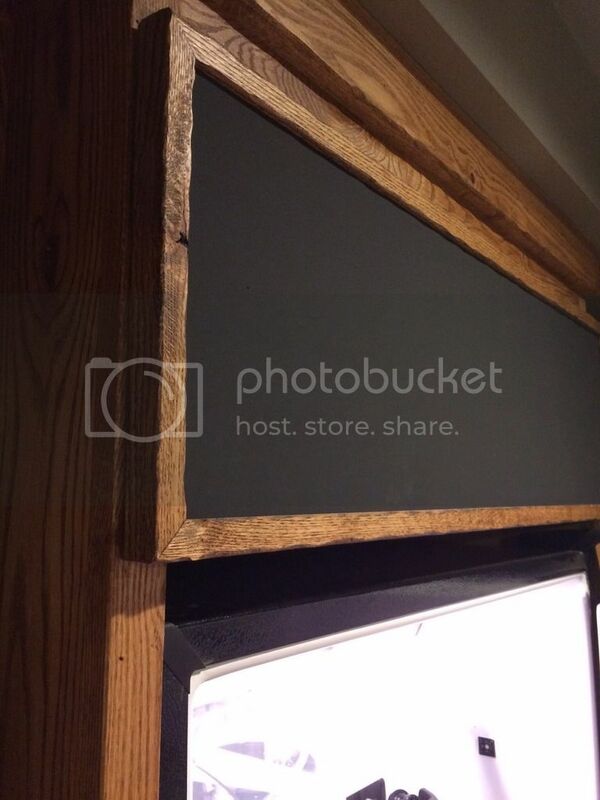 It looks awesome and I'd love to replicate it if possible... Thanks! I kind of went cheap with the hood. I made an inner liner from 3/4 2 sided grey melamine and siliconed all the joints I then made an outer frame so that the corrigated steel would slip in. I used the same fan that Kal recommends and it sits above the liner and I can access it by removing a section of the corrigated steel. I also wrapped the fan in insulation to cut down on noise and to keep any condensation from forming on the outside of it. I only have about 3' max of piping from the top of the fan to where it exits the house so if it is really cold outside I get a bit of cold penetration. I think I could upgrade my vent cover outside as it does not seal off that well when the fan is off. I also put super low profile LED lights on the front edge of the inside. They came in 12" sections and I put 5 of them in there. I siliconed all the joints and ends. Hopefully they will hold up. Nicely done! 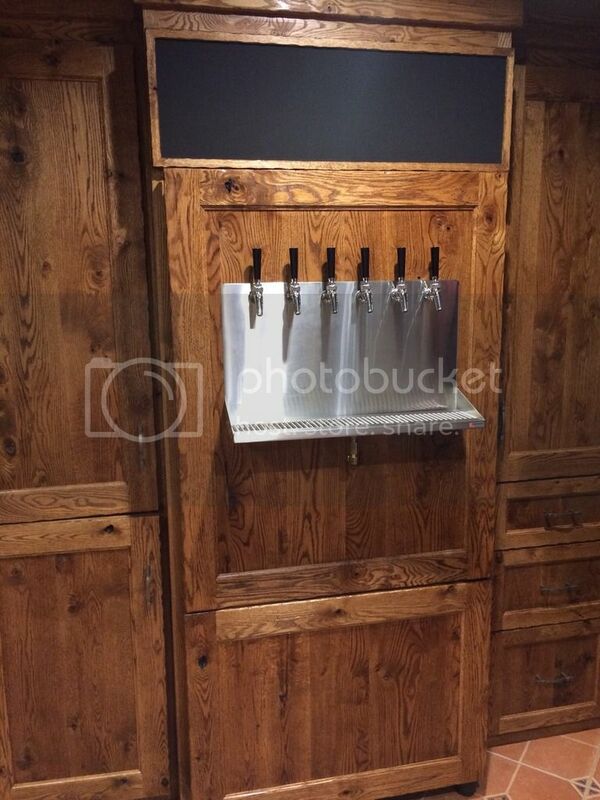 I'd be interested to see more photos of your kegerator if you happen to have some. Looks similar to the generic plans I have in my head. I'm curious to see what you did there. Looks great all around! The kegerator was pretty easy. 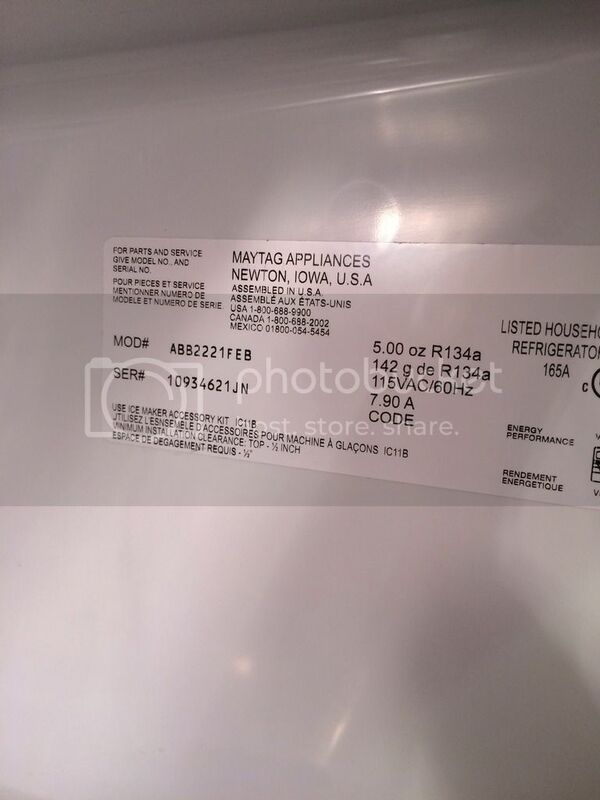 I found a used refrigerator on Craigslist. 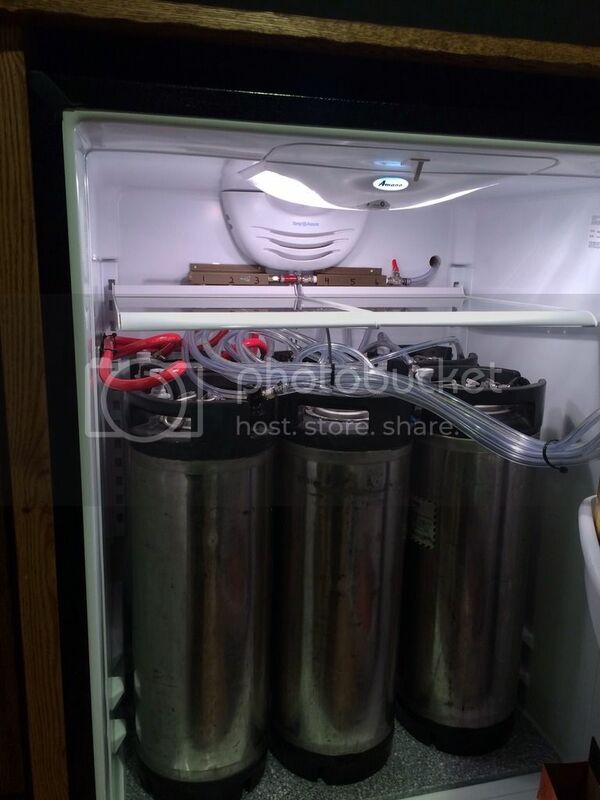 I knew that the Amana bottom freezer model would hold 6 kegs with the Co2 stored on the outside. I had an extra piece of Coran left over from something else so I cut that to fit the bottom because the weight of the kegs is a bit too much for the bottom of the fridg. I build the wood panels to cover the front and wrapped the wood around the edges and that is where I fastend the panels to the refrigerator door. 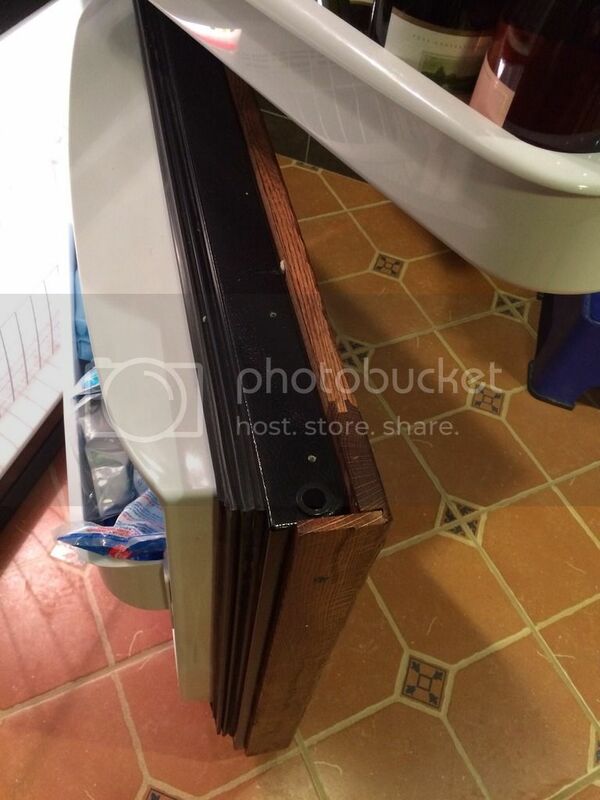 If you only go about 3/8" thick with those sides the function with out impeding the function of the door. I bought the stainless drip tray online (I can find that link if you want it) the taps are Perlick 650ss. They are a little pricy but the quality is really nice. Right now I have 2 3 gang distribution bars all on the same regulator. I plan to split things up at least once as I'm sure I will want different keg pressures . I just haven't figured all that out yet. I drilled the hole for the Co2 through the back so that I could pull out the fridg if I want to. Going through the side in my particular situation would necessitate removing the hose to pull out the fridg. I was very carful to drill threw the plastic only going from the inside out for the Co2 line. I modified a spade bit so that the center point would barely penetrate the plastic. After I removed the plastic I used a small screw driver to remove the insulation all the way to the back so that I could see a clear shot all the way through so that I could drill the back out. I was lucky enough not to land on top of a cooling line. 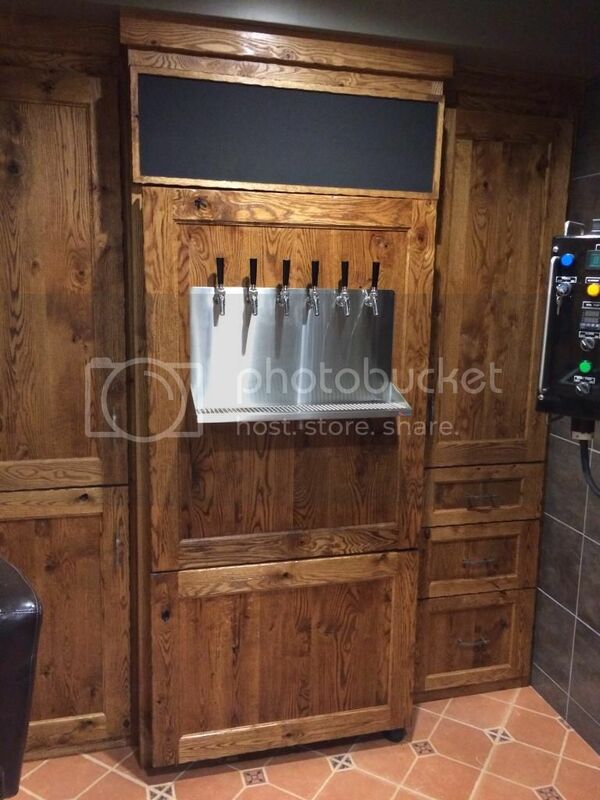 Great kegerator build! 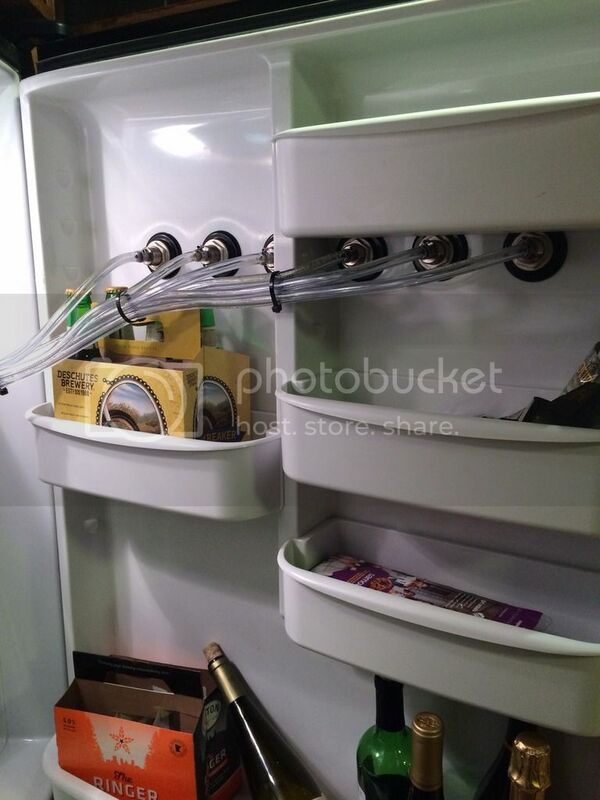 I've seen some upright freezers out there that I think would fit 10-12 kegs total with a sturdy shelf in the middle. I'm hoping to do something similar. My big concern is hitting that coolant line while drilling for the CO2... quite a gamble, but glad it paid off for you.